Featuring the top brands in scuba diving equipment! 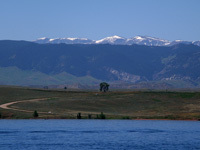 Canyon Ferry Reservoir is located approximately 20 miles east of Helena. The dam and visitor center is located at the north end of the lake. From Helena, take Highway 12/287 past East Helena and to the blinking light at the intersection of Highways 12/287 and 284. Turn onto Highway 284. The dam is located approximately 8 miles from this intersection on Highway 284. You can dive from the shore along the western side of the lake at marked picnic areas. Boat diving will allow you to explore areas that aren’t reachable from shore- Cemetary Island is a popular dive. Camping is available at various locations around the lake and Kim’s Marina offers RV camping and cabins. Located 90 miles south of Billings, the Big Horn Canyon National Recreation Area is a great dive location. The reservoir was created by a hydro electric dam built on the Big Horn River. The canyon walls are steep and continue past the water level, creating a interesting topography. The fish are timid, but can be found if patient. Typical fish to be found are carp, ling, wall eye and small mouth bass. The reservoir is 50 miles long, the southern end is in Wyoming. The area is a popular spot for fishermen and water skiers. The canyon has many little coves off the main canyon that allow the divers and fishermen to get away from skier traffic. Boats are necessary to access the dive sites. Boat rentals are available at the marina. Air fills from the Montana end are available at Adventure Scuba in Billings. Nitrox is also available. Water Temperature ranges between 65- 75 degrees, visablity of about 10 – 30 feet during summer, better in the fall. Thermo clines should be expected. Recommended exposure wear would be 7mm wetsuits or dry suits. All dives in Montana are high altitude dives and proper training in dive planning for altitude is recommended. Local orientation dives available through Adventure Scuba. Glacier National Park is located in Northwestern Montana near Kalispell MT. 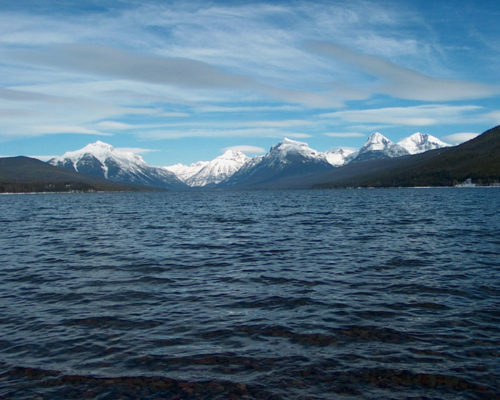 One of our favorite dive sites is Lake MacDonald. There are several areas that you can dive in the lake, but one of my favorites is at Apgar Village. It is easy to access and is home of the “Pitch Fork Forest”. The Pitch Fork Forest is a debris field of various rakes, axes, and of course, pitchforks. In the early days of the park, taking out the trash at the end of the tourist season meant dragging the trash out on to the ice. In the spring the ice would melt and the trash would sink to the bottom. Divers discovered these artifacts and placed them upright on the bottom of the lake, and the forrest was created. Flathead Lake is the largest natural freshwater lake west of the Mississippi River in the contiguous United States.Its surface area of between 191.5 sq mi and 197 sq mi, it is slightly larger than Lake Tahoe. 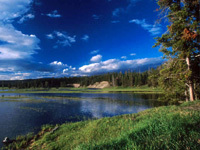 The lake is a remnant of the ancient inland sea, Lake Missoula of the era of the last interglacial. Located in the northwest corner of the state of Montana, 7 miles (11 km) south of Kalispell, it is approximately 30 miles long and 16 miles wide. The lake offers great diving oportunities. 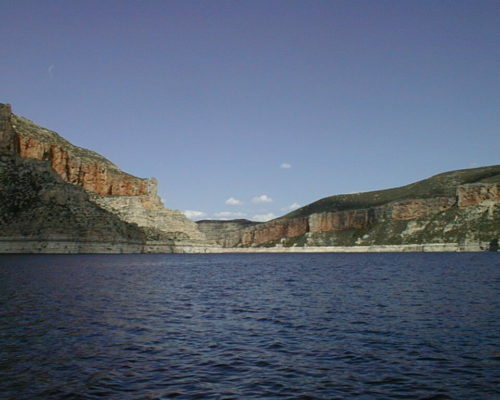 Lake DeSmet is located just off the interstate between Sheridan and Buffalo, Wy. It is named after Father Jean DeSmet. He was the first Catholic priest in the region and a monument honoring him is on the north side of the lake. This monument also marks the way to our favorite place to dive on the lake. The lake has a gentle sloping shale bottom, making a great place for novice divers and advanced divers alike. Old Faithful isn’t the only thing to see in Yellowstone National Park. Divers like to explore the underwater world of the park. 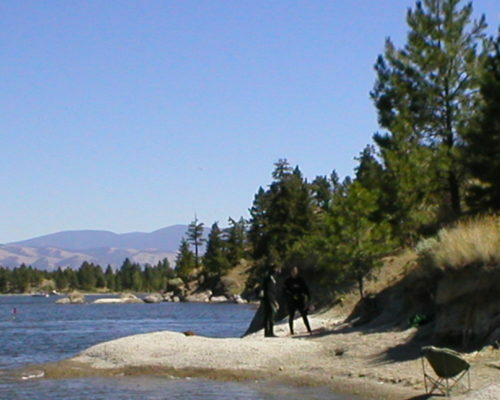 Two popular dives are in front of Lake Hotel and at the swim access on the Firehole River. 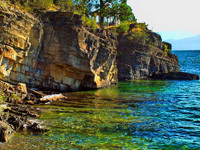 It’s a pretty steep hike down to the shore in front of the Lake Hotel, but you won’t be disappointed. Diving the Firehole is a little trickier and should not be attempted until late summer. Diving these areas with someone who has experience in the area is recommended.